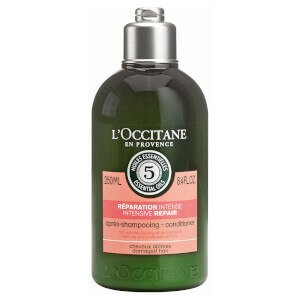 Strengthen your strands with L'Occitane Aromachologie Intensive Repair Shampoo, a deeply nourishing cleanser designed for damaged hair. The silicone-free formula envelops hair from root to tip in order to rebuild and strengthen the fibre, utilising an essential oil blend and Provitamin B5 to help prevent further breakage. Effortlessly lifting away dirt, excess oil and impurities, the shampoo replenishes intense moisture to maintain a healthy scalp balance and add softness and shine to tresses. Suitable for dry and damaged hair. Dispense a small amount of shampoo into the palms of your hands and mix with water to create a lather. Gently massage the scalp with the fingertips in circular motions for a pleasant sensory experience. Start preferably at the nape of the neck, then near the temples, and finish with the top of your scalp. Rinse with lukewarm water and follow with the Aromachologie Intensive Repair Conditioner. Aqua/Water, Sodium Laureth Sulfate, Decyl Glucoside, Peg-7 Glyceryl Cocoate, Cocamidopropyl Betaine, Citrus Aurantium Dulcis (Orange) Oil, Lavandula Angustifolia (Lavender) Oil, Pelargonium Graveolens Flower Oil, Cananga Odorata Flower Oil, Angelica Archangelica Root Oil, Angelica Archangelica Seed Oil, Avena Strigosa Seed Extract, Lavandula Hybrida Oil, Helianthus Annuus (Sunflower) Seed Oil, Panthenol, Sodium Chloride, Polyquaternium-7, Glycerin, Coco-Glucoside, Glyceryl Oleate, Sodium Benzoate, Hydroxypropyl Guar Hydroxypropyltrimonium Chloride, Citric Acid, Lecithin, Potassium Sorbate, Hydrogenated Palm Glycerides Citrate, Ascorbyl Palmitate, Tocopherol, Parfum/Fragrance, Limonene, Linalool.